Baby Cafe is a Monday morning meet up program for moms living in the Uxbridge area who want to connect with other parents. While it might sound tough getting organized to take baby out of the house on a Monday morning at 9am, it is worth it. I find it hard to get back into the swing of things after having so much help from my husband on weekends, that I find the time spent at these type of meet ups invaluable for support. As a welcome bonus, a lactation consultant will be present each week to answer questions. 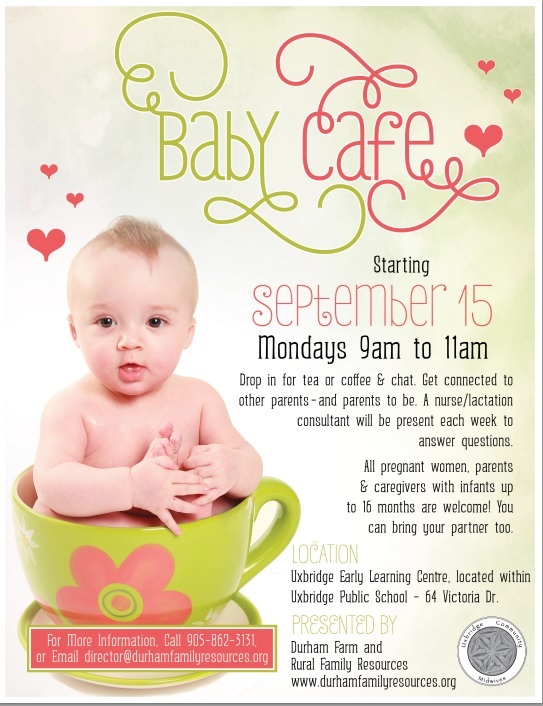 The Uxbridge Baby Cafe program is free and no registration is required. This program continues until December 15th, 2014 and is hosted at the Uxbridge Parent and Literacy Hub, located in the Uxbridge Public School (64 Victoria Drive, Uxbridge). For more information, call 905-862-3131 for details.